EDIT: Having read these great answers I feel a little ashamed for the fear I felt on this recent flight. However, judging by my reaction to the experience and the reaction of those around me on the flight I imagine I am not the only one who felt this way. As others have mentioned here I will agree that passengers are pretty bad at judging turbulence. For those who come to this Stack Exchange site with similar concerns, I hope that you read these answers from those knowledgeable in the field to assuage your concerns. I was recently on a flight that flew in to central Texas coming from Denver. There was bad turbulence on the flight in the last 45 minutes -- the worst I have ever experienced -- and I was curious about what else was going on behind the scenes from the perspective of the pilot and crew. I do not know the airplane model. It has ~38 rows and 3 seats on each side of the aisle. I was in row 35. It was a standard commercial airplane that would fly across the United States. We were first told that we were about to enter a turbulent area based on reports of other airliners in the region. We soon entered an area of lightning and dense clouds so thick that there was no visibility outside the windows. The first drop came unexpectedly in what I can only describe as similar to a bad, bumpy landing on the freeway. The bags rattled pretty hard and loudly and I felt myself leave the seat. It was loud and jarring enough for most of the people in my area to scream out loud. Over the next 45 minutes, these drops happened continuously and randomly, up to 15 times. Between these big drops the plane felt like it was swaying from the left and right. There were also many tiny dips between the bigger dips. It was extremely tense for everyone on the plane and generally it felt very uneven below us so there was a constant anticipation of another drop. After the landing gear went down, it was clear that we were ascending again. The pilot explained that there was a "spacing" issue on the ground so he was going to fly around and try to land again. The guy next to me said (jokingly?) that this meant the pilot was too scared to land. The cabin crew looked pretty terrified, and they were chatting to each other throughout the whole ordeal. People were sobbing and weeping all around me and they would yell every time a drop happened. Many people on board were fairly traumatized by the experience. Was there any real danger from turbulence this bad? Is this something a pilot might encounter routinely that they would be equipped to handle or does this seem unusually bad? What was happening behind the scenes? How does a pilot handle a situation like this? Was there other information about the turbulence that we were not being told? Any other interesting, related information to give me insight into this experience would be appreciated. Very little to go on (non-pilots are lousy at classifying turbulence) but my best guess is that you experienced moderate turbulence. I couldn't focus my eyes to see. Someone who wasn't belted down was flung violently against the ceiling, then slammed to the floor. The captain was very assertive, telling the FAs to be seated immediately and that all passengers must strap in. The flight attendants wedged the service carts into the gaps between the seats and asked some passengers to hold them down, before sitting down and securing themselves in with their full 4 point harness. During the worst of it, there was no way anyone would have been able to stand, even if you were holding onto the seats or walls. Some overhead bins popped open strewing their contents about the cabin. There was coffee, cups, plastic glasses, books, etc. flying around EVERYWHERE. Several people had to be taken off the plane by stretcher. Pilots are not "scared to land". If it's not safe, they will divert. If the approach is wrong, they will "go around" (both perfectly normal) and spacing issues are the most likely reason. Why would the captain lie? The reaction of passengers is not a good indicator of the level of turbulence but the bottom line is, aircraft are designed to cope with the worst turbulence, and then some. You were perfectly safe. I have to take issue with your use of "air hostesses", I believe you mean "cabin crew" or "flight attendants". We stopped calling them that when we realised that they are actually professionals with a vital safety role as their primary function and are of both genders. I agree with @Simon that, given your description, you were in moderate turbulence, and as such you were not at risk. You mentioned that the flight attendants looked terrified, which implies that you were able to see their faces, which might mean they were up and about? If so, you were not in severe turbulence. In severe turbulence the flight attendants are going to be strapped down. My guess would be that what you saw on the the flight attendants' faces was irritation rather than terror, unless they were newbies. As Simon mentioned, passengers are poor reporters when it comes to turbulence. I was in the back of a 727 well aft of the wing over Texas many years ago. They stopped the beverage service when a flight attendant got dumped onto a passenger's lap. I already had my carton of milk (I'm a milkaholic). I was trying to drink it between bumps without much success, and I found my efforts laughable and started laughing. The passenger next to me asked how I could laugh at a time like this when we were obviously in great danger. I said something like, ah, what danger? to which he replied that I should look at the wing tips, that they were moving up and down. Whether my explanation that they were supposed to do that and that we were in no danger really consoled him or not, I do not know. It's an oversimplification, but the wing is designed to stall before it will overstress the aircraft, regardless of the turbulence. People have been occasionally hurt in severe turbulence, though, by flying about because they didn't fasten their seat belt, or by overhead bag compartments opening and bags flying. It's very rare though, and preventable. Large aircraft typically have a recommended turbulence penetration speed to ensure margins for both the high-speed buffet and stall speeds. The 747-100/200 aircraft also had a TURB mode for the autopilot for use in moderate to severe turbulence, although I always found I could do a better job hand-flying than those old autopilots could insofar as handling turbulence. I would guess that current autopilots can do a better job than hand-flying. My personal way of judging whether we were in truly severe turbulence was that if I was having trouble reading the instruments because my eyeballs were jiggling too much, that was severe turbulence. Also, if you're in it long enough, when the flight is over, the area around your hips may be a little sore for having been forced against your seat belt so hard and so often. Turbulence can be caused by a variety of different weather patterns. The one you describe in TX as "an area of dense clouds and lightning so thick that there was no visibility outside the windows" is probably a thunderstorm. 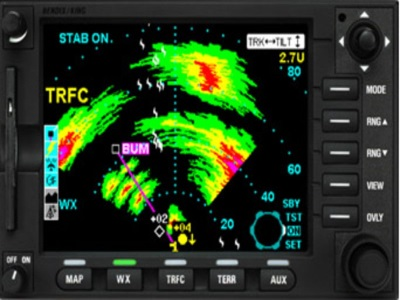 Inside the cockpit, the pilot has a weather radar system that tells her instantaneously where the densest area of precipitation is, such as the magenta area at the far right of the 40nm arc. Aircraft equipped with radar can easily fly around the worst parts of the storm, but that doesn't mean they miss it all together. Your pilot probably had to fly through part of the storm to get to the destination. The go-around could have been for 'spacing,' but it could have been a normal missed approach as well. 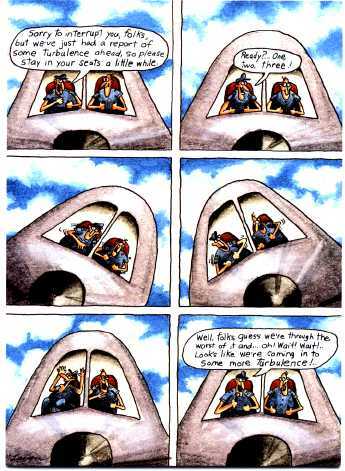 When I was in training, we had specific explanations on the effects of the different levels of turbulence. Turbulence that momentarily causes slight erratic changes in altitude and/or attitude (pitch, roll and yaw). Occupants may feel a slight strain against seat belts or shoulder straps. Unsecured objects may be displaced slightly. Food service may be conducted and little or no difficulty is encountered in walking. Changes in altitude and/or attitude occur but the aircraft remains in positive control at all times. It usually causes variations in indicated airspeed. Occupants feel definite strains against seat belts or shoulder straps. Unsecured objects are dislodged. Food service and walking are difficult. Turbulence that causes large, abrupt changes in altitude and/or attitude. It usually causes large variations in indicated airspeed. Aircraft may be momentarily out of control. Occupants are forced violently against seat belts or shoulder straps. Unsecured objects are tossed about. Food Service and walking are impossible. To comment on the "going around" for another attempt. This is always ok. Perfectly normal. There can be countless reasons why this might happen. And when it happens, the captain has decided that it is safer to go around than to continue. The only place turbulence may be a problem is close to the ground (ie. on approach to land). If there is a sudden downdraught close to the ground, there may not be enough height to recover. This has happened in the past due to a microburst but most modern airports now have specific radar designed to detect these phenomena. If all the flight attendants are strapped in, injured, or crying uncontrollably, and preferably all at the same time, then you probably can go off the flight attendants. Maybe. In all other situations you should not. Even if you correctly detect stress it could be for a whole more reasons than the turbulence you are experiencing - because they fly so often, they will have experienced worse, many times before. You have a trained professional crew up front, who again will have experienced this many many times, they might not be happy about it because they want their passengers to have a smooth ride at all times, but refer to my first sentence before you even worry about the flight crew getting upset or crying also or it affecting their professional judgement in any way whatsoever. Also its far easier in these situations if you are driving than just sat in the back waiting for the next bump. If you are on the sea you expect the odd wave and can see it coming, its difficult in the air because you can't see the wave coming. I much prefer sitting in the cockpit myself than sat in the back, in particular if the weather is rough. You would be amazed at how calm it is no matter what the weather (or anything else for that matter). The pilots will be totally relaxed. The only time turbulence will really get their attention is when on approach - the closer you are to the ground when it happens the more attention the pilot will pay to it. Remember the wings rock when the pilot wants to adjust the direction you are going and the wind often changes more than once on approach (a lot more if its gusty), so its the pilot moving the wings in that case to keep the nose of the aircraft pointing in the right direction because he/she has to do that to change the direction you are heading when the wind blows it off slightly. The wings are used rather than the rudder because its the correct technique, if the rudder was used, now that really would be uncomfortable (and potentially dangerous). Also if the pilot doesn't do this, you will miss the airport by a mile. So what you think is turbulence on approach might be a bit of both - the turbulence itself and the pilot also telling the aircraft exactly where it needs to go. A good game to play is to try to work out which wing rocks are the pilot and which are due to turbulence. The pilot will be smoother (hopefully). The only other thing I would like to add which I hope will help, is that if you watch a video of airliner wings being stress tested, the wingtips more or less have to touch each other before the wing breaks. Not quite perhaps touch but they move a whole lot further than you will ever see in flight. Severe turbulence can injure people walking around because it could pin them to the roof and then drop them to the floor the next second. Thats why you have the seatbelt signs on at the first sign of turbulence. However, even if this happened and dozens of passengers were injured in this way, the aircraft would be totally undamaged. Obviously something the pilots will try their best to avoid. I hope this answer helps. Please just relax and enjoy the ride, aircraft are not designed to fall apart in the air the first bump that comes along, they fly for thousands of hours in situations like this and sometimes pilots just can't avoid the turbulence if its one of those days where its everywhere! Turbulence is part and parcel of flying. Rest assured that pilots are trained to handle all types of turbulence in the simulator training. Airplanes are equipped with radar to detect precipitation which usually cause turbulence. Not the answer you're looking for? Browse other questions tagged safety turbulence or ask your own question. Do we have a unit to measure turbulence? Are most/all flights affected by a noticeable amount of turbulence? Was this Gulfstream way below the glideslope? How can cargo be jettisoned from a C-124 in flight? When to slow down to Va for turbulence? How is close formation flying possible with things like thermals and turbulence? Are there rules about using the “Fasten seatbelt” sign outside of take-off/landing/turbulence? How dangerous was this approach of a Dash8 Q400 really? How many Airbus planes have been destroyed in flight by severe turbulence? Why would all passengers be asked not to eat peanuts when there is one allergic person on board?